The tradition of painting has been carried on in the Indian subcontinent since the ancient times. The Indian folk paintings, their styles and patterns are as diverse as the Indian nation itself. The Indian folk art list includes wall paintings, calendar paintings, oil classics, cave paintings, miniatures etc. Folk paintings are pictorial expressions of village painters which are marked by the subjects chosen from the epics like Ramayana and Mahabharata, Bhagvata Purana as well as daily village life, birds and animals and natural objects like sun, moon, plants and trees. Folk paintings use very vibrant and natural colors and papers, clothes, leaves, earthen pots, mud walls, etc. are used as canvas. Folk paintingsare diverse in India and reflect rich cultural heritage and they are the true examples of artistic expression. They are so variable from region to region because of the availability of material in different area. Indian folk paintings include the various paintings of India that have been practiced since ancient times. Phad paintings, warli paintings, madhubani paintings, patachitra, gond paintings, kalamkari, pichwai paintings, kalighat paintings etc. are some of the famous folk art paintings in the country. Folk art paintings include pictorial depictions as the Hindu deities like lord Krishna, Rama, Shiva, goddess Durga, Lakshmi and Saraswati. There are madhubani paintings of the sun, the moon and religious plants like ‘Tulsi’ are widely painted as also royal courts and social events like marriages. In Rajasthan, the folk paintings are usually made on some particular occasions like marriage, birth ceremony and festivals. This tradition of folk paintings is found in villages and rural areas practiced by various tribes. Folk paintings did not emerge in chronological order but evolved in various region of India depending mainly upon the rural cultures, mythological stories and everyday rituals. In Phad paintings, the depictions of historical heroes such as Goga Chauhan, Prithaviraj Chauhan, Amar Singh Rathor, Tejaji and others are common. In contemporary times, the stories from the life of Papuji and Narayandevji are mainly depicted. The pad is paintd in bold colors and is rolled on two shafts of the bamboo tree, thus making it easy to carry. Painted by Joshis of Shahpura, they have been used for centuries as a backdrop by the bards (bhopas) of Rajasthan who go from village to village singing about the exploits of legendary heroes. 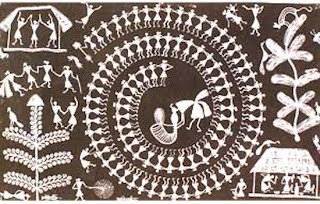 Warli paintings of Maharashtra have some common folk paintings of marriage god, Palghat, his horse along with the bride and groom. 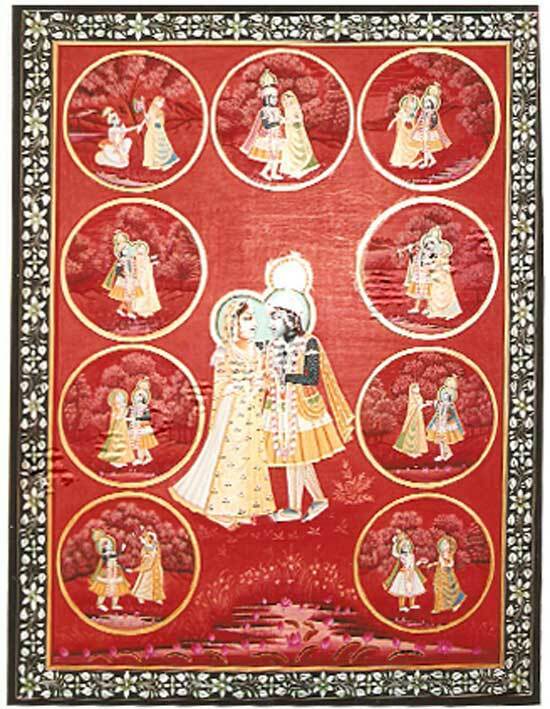 These paintings are special as they depict marriage ceremonies. Another popular theme of this form of folk art is the dance that men and women perform in circles and spirals around a musician. Madhubani or Mithila art is persistent in some areas of Bihar and Uttar Pradesh. It is told that the painting evolved when king of Mithila, Janak asked the painters to draw the marital ceremony of his daughter Sita with lord Rama, the prince of Ayodhya. These paintings are made on various mediums such as clothes, hand made paper and canvas. The main themes ofMadhubani paintings contain images of Hindu gods and goddesses such as lord Krishna, Rama, Shiva, Durga, Lakshmi, Saraswati etc. The village women paint the pictures of Ramayana, Mahabharata,Krishna leela and other Hindu mythologies as well as birds, animals and other natural objects on the mud walls of their hut. Nowadays it is done on paper and clothes. 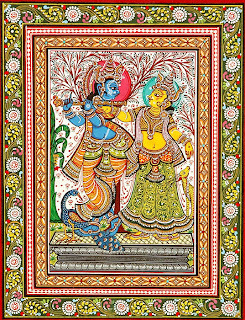 Pata Chitra paintings have paintings that are inspired by the Bhakti movement. They are mainly based on the religious subjects that revolve around Lord Jagannathat Puri's famous Jagannath Temple. Hindu gods and goddesses are also depicted in the patachitra paintings.Patachitra paintings are known for their bold lines and brilliant colors. It is a hereditary art practiced by the family of the painters usually living in the vicinities of the temples. Patachita paintings have an important role in the temples of Orissa. 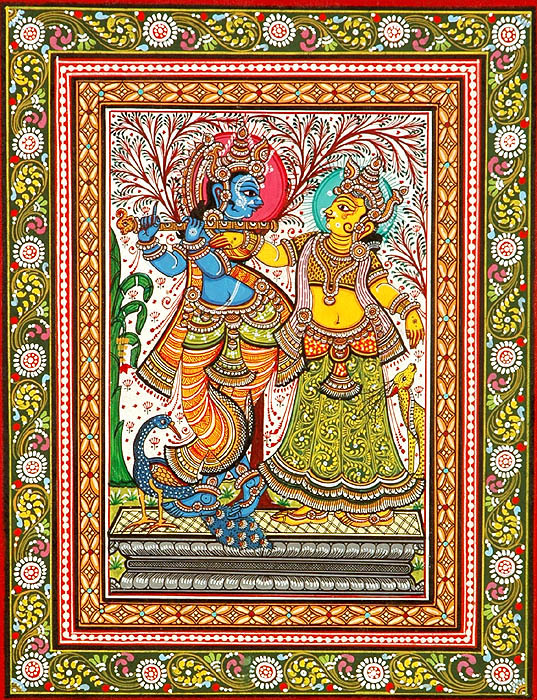 Patachitra painting is a distinct art form that originated in Orissa. Patta in Sanskrit means 'clothes' and chitra means ‘paintings’. Each year, the painted wooden images of lord Jagannath alongwith Balabhadra and Shubhadra are ritually given the holy bath. Hence, they are removed from the Garbha Griha for repainting. During this period, the temple images are substituted for three patachitra paintingsrepresenting them. 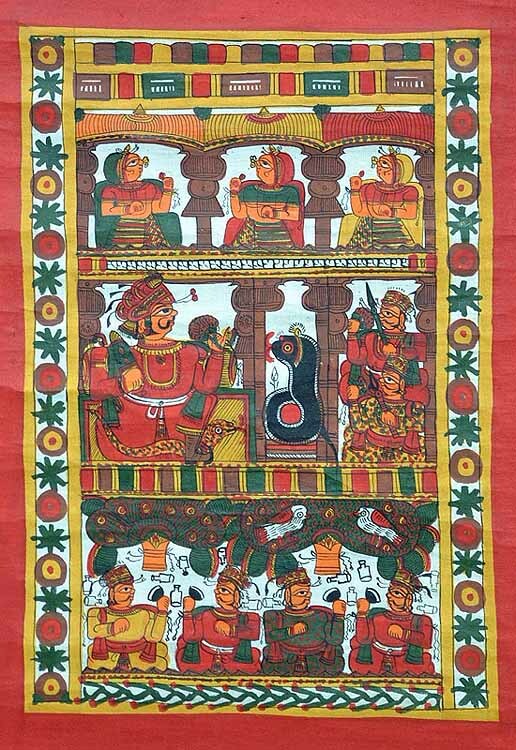 Pichwai paintings are cloth paintings that depict the scenes from the life of lord Krishna and are used as the backdrop for his idol in the Nathdwara temple, near Udaipur. Nathdwara is famous for the pichwai paintings. 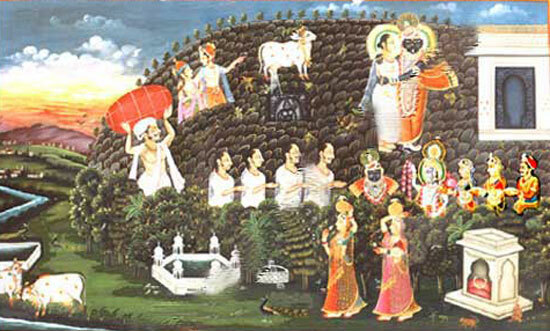 The main theme of thesepichwai paintings is lord Shrinathji and his exploits. Pichwai paintings are made in dark rich hues on rough hand spun cloth. These paintings have deep religious roots and are executed with the utmost devotion of the painters. 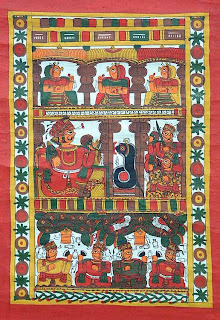 The pichwai paintings of Nathdwara, is an embroidered cloth-hanging used as a decoration in temples and temple-chariots. The theme of the pichwai paintings varies according to the season and its moods. Each pichwai denotes the worship of lord Srinathji in a different season. Temples at Nathwada celebrate cloth hanging ceremony. This ceremony is considered as very sacred amongst the devotees. 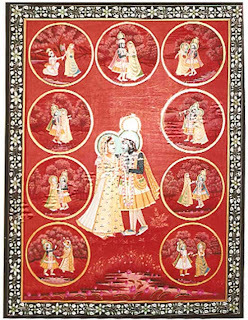 Pichwai paintings use colorful embroidery and outlines are normally dark colored. Colors like yellow, green, black and cream are used in stitching whereas background is mostly in red color. Many painters also use gold threads in designing work. To highlight the outline, white color is used. pichwai paintings represent a great tradition of Indian art. Pichwai paintings are identified by various features such as large eyes, broad nose and a heavy body, similar to the features on the idol of lord Shrinathji. Kalighat in Kolkata, West Bengal, is famous as a Hindu pilgrimage. Kalighat is the place where the temple in honor of the goddess Kali is built. 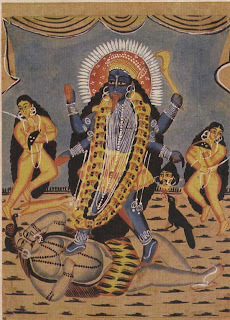 Kalighat paintingsoriginated in the 19th century, in the vicinity of Kalighat Kali Temple, Kalighat, Kolkata. 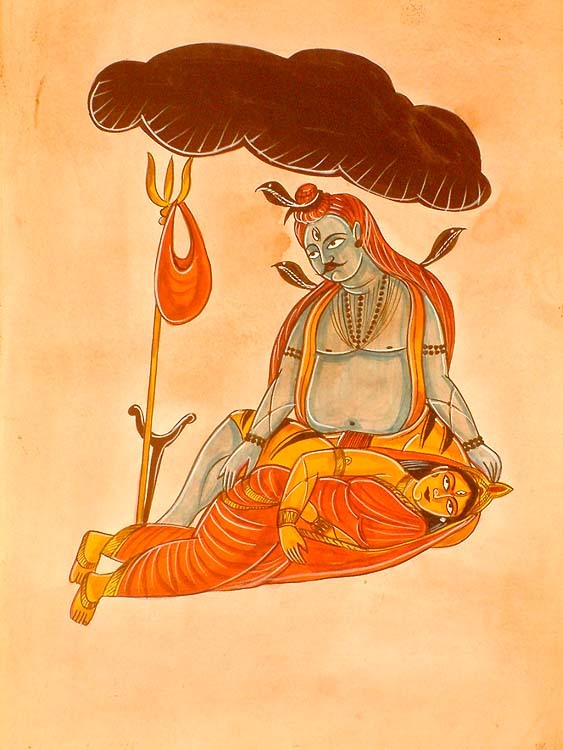 Kalighat paintings depict a variety of themes such as Hindu gods, goddesses and other mythological characters. Kalighat painters also portrayed day-to-day themes in their paintings. The day-to-day happenings of society provided rich themes in their paintings. Sometimes even images of birds, animals, snakes and fishes are found in the paintings. Kalighat painting is a style of Indian painting derives its name from the place. Like most other Indian art forms,Kalighat paintings too started with a religious note. 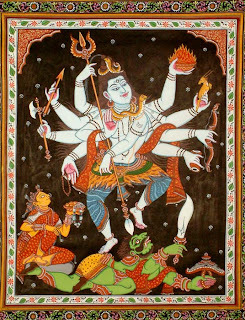 Hindu gods and goddesses along with their incarnations were painted by the painters. Kalighat painting started getting its deserved attention and appreciation only in the twentieth century. The styles of these paintings were characterized by broad sweeping brush lines, bold colors and simplification of forms. These paintings were sold to the devotees who visited the Kalighat temple. Gond paintings are the tribal folk art paintingsof India. Gond paintings are extremely popular among most tribes in Madhya Pradesh. Gond paintings are the living expressions of the people of the tribal villages that are deeply linked with their day to day lives. Gond paintings were traditionally made on mud wall houses. Recently, the Gondi artists have started painting on canvas or paper. Gond paintings are made by Gondi people who live in parts of Madhya Pradesh, Maharashtra, Chattisgarh, Andhra Pradesh and Orissa. 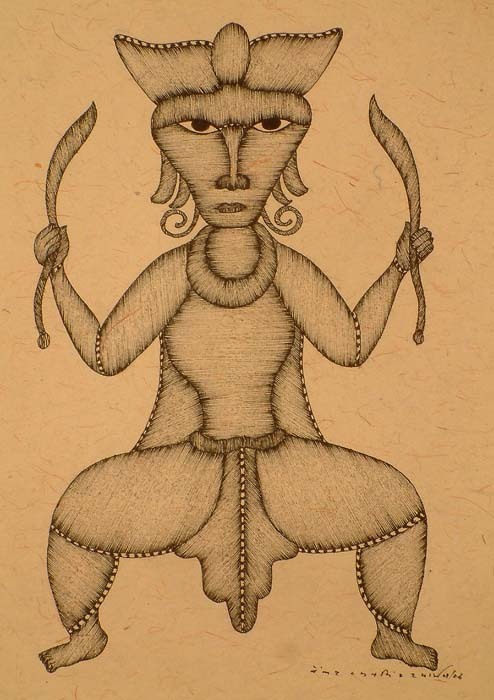 Gond paintings have numerous themes including folk stories, gods, goddesses, nature, religion, birds, animals etc. The artists reflect their perception of life through these freehand paintings. For wall paintings, mud plaster base is used over which linear patterns are etched with the fingers. Gond paintings reflect the artists’ creativity and unique view of things around them. Kalamkari painting is a beautiful art form of Andhra Pradesh. Kalamkari refers to a method of painting natural dyes onto cotton or silk fabric. Kalamkari literally means, Kalam (pen) and kari (work), which means art work done using a pen. The artists use a bamboo or date palm stick pointed at one end with a bundle of fine hair attached to this pointed end to serve as the brush or pen. Vegetable dyes are used on cloth to color the drawings. The dyes are obtained by extracting colors from parts of plants such as roots, leaves along with mineral salts of iron, tin, copper, alum etc. 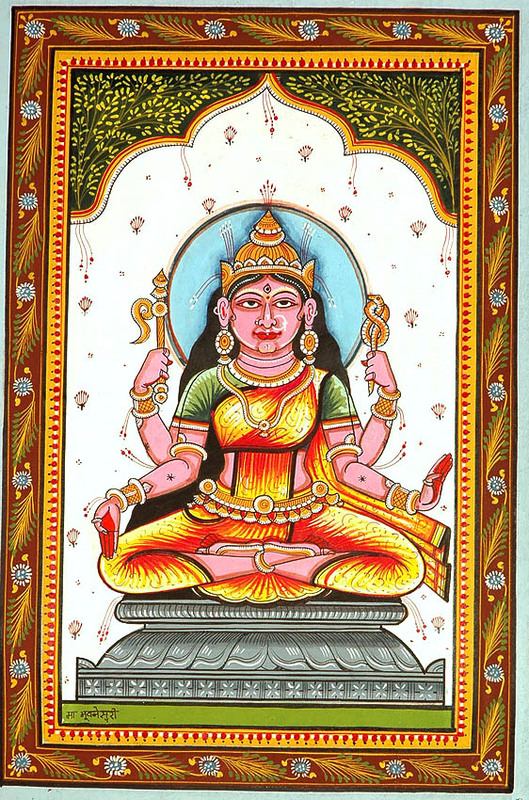 Masulipatnam and Kalahasti are the two main areas where this art is practiced. The themes of Kalamkari paintings are essentially Hindu mythology and Hindu Gods and Goddesses. The colors used are all natural dyes like the ochre, indigo, charcoal black and red. The figures are well defined with sharp features and elaborate ornamentation. Like every other folk art, the art of Kalamkari painting is passed to the son by his father. This is done mainly by the male members of the family. This art form has been enriched through generations as the techniques of craftsmanship are given as heritage to the descendents. 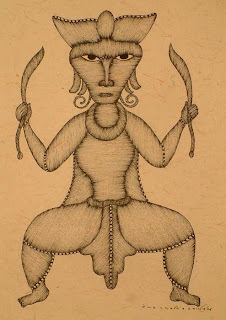 The Santhal tribe, one of the eminent tribes belonging to the state of Bihar (India), has a distinctive technique of painting, which is well-known as Santhal paintings. The themes for thesepaintings are chosen from the natural surroundings or from the activities of everyday lives, such as a happy family, fields, dance, quarrel, beating wife, gods and goddess, wine party etc. These paintings reflect the simplicity of artists.All paintings are courtesy of Art of Legend India.